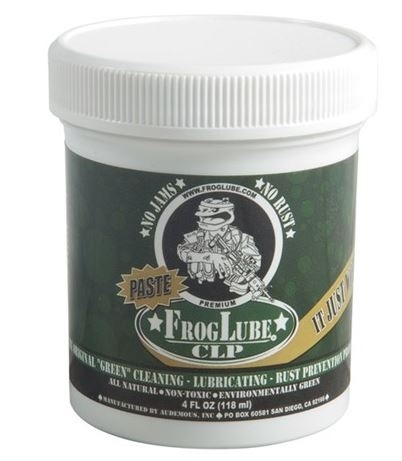 Non-toxic cleaner/lubricant/protectant removes powder residue, carbon, grease, and other corrosion-causing contaminants left on your firearm after firing. When applied to warm metal, FrogLube "seasons" deep into the pores of the metal. With repeated applications, it forms a slick, protective surface that reduces friction and helps prevent corrosion during storage. Once dry, it will not attract dirt and grit like petroleum-based lubricants. It causes moisture to bead on contact and roll off. Made from 100% biodegradable food-grade materials, FrogLube lubricates all points on a firearm including bolts, rails, lugs, and bearing surfaces. Can be safely applied to plastic, metal, wood, and rubber also.